Sloppy language works for cheats and charlatans. In the search for the truth only accurate language will do. 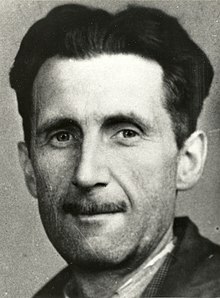 Orwell understood the power of language to change the way we think, indeed to fence off some possible options completely. Roger Pielke Snr put out a call today asking for precise definitions and protesting about the misuse of the term “climate change”. But when did this nonsensical term start? Where else, but with the UN. In other words, there is no “climate change” without humans because there cannot be, and by extension, the climate did not change, could not have, for the 4.5 billion years before 1880 when the first coal powered electricity station was fired up. Such nonsense is what international treaties are made of. Only millions of taxpayer dollars could have propagated an inanity so profoundly inane, and so abjectly silly. No mere student report could have swept around the world destroying sensible conversation for two decades (and taking the entire field of paleoclimate as collateral damage too). By misusing “climate change” so audaciously (and getting away with it), the UN ensured that an army of distracted or not-too-sharp supporters would adopt it, and it would reduce conversations about the role of man-made emissions down to a caricature. “Do you believe in climate change” — ask the thought police, it’s a loaded question that invites any sane person to say “Yes” — because who believes in climate-sameness? The term “climate denier” springs from this sick well — as if, somewhere on the planet, in asylums or day care centers, there might be someone who denies we have a climate. Bystanders watching a debate at this nonsensical level don’t accidentally step into the dissenter camp — by default, they are “with the UN”. The answer to stopping this is to turn the nonsense against those who issue it, and not fall for the tactic and join the perversion. So when the journalists / pollsters inanely repeat the litany — there are lots of options. 3. Have you heard of an ice age? So yes, I agree wholeheartedly with Roger Pielke, but we need to do more than just expect science journals to be scientific, we must demand that journalists and pollsters use English.